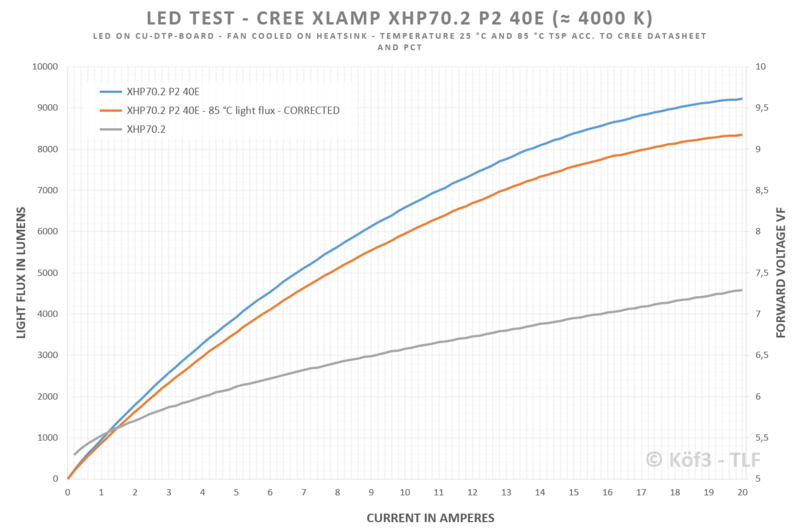 LED test / review - Cree XLamp XHP70.2 P2 40E (4000 K) - The second generation of extreme overcurrent and light flux capability? Originally, this (my) test was posted in the English forum of the German Taschenlampen-Forum (TLF). To give you the oppertunity to discuss about this emitter in this forum, I will also publish this test here. I hope this report is helpful for all of those who want to build some lights with this really big LED. The XHP70.2 belongs to the second generation of eXtreme High Power (XHP) series. Introduced in the XP-G3, a new LED chip technology was introduced which improves the forward voltage (Vf) Behavior, optical characteristics and also the heat dissipation.The XHP70.2 also uses that, which should improve the overall power capabilities and efficiency alike. I purchased the emitter from Mouser. Unfortunately, the first sample was not working properly – the nominal light flux at binning conditions was at least ≈ 20 percent lower than stated in the datasheet. In addition to this some of the dies already lit up at 3.2 Volts, despite missing overcurrent. But Mouser reacted in a professional way and after a short conversation they send me a replacement, which I used for this test. 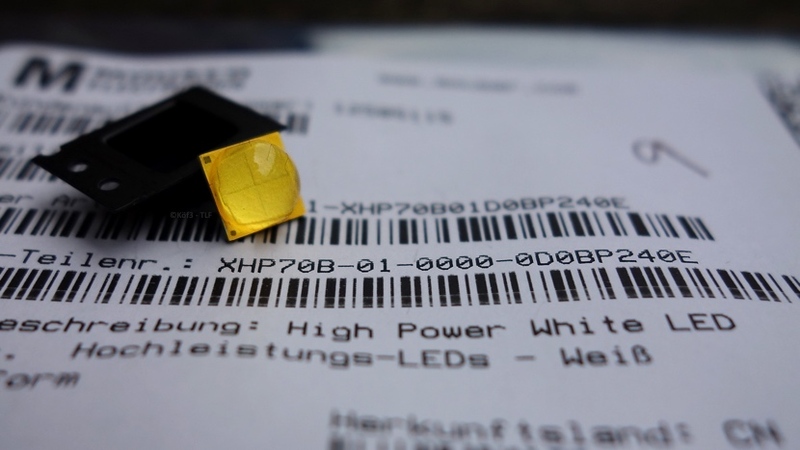 Like all new generation Cree LEDs the XHP70.2 appears yellow in color. The whole visible die including the outer surfaces is covered with phosphor; the external dimensions are 7.00 x 7.00 mm (0.276 x 0.276 in). 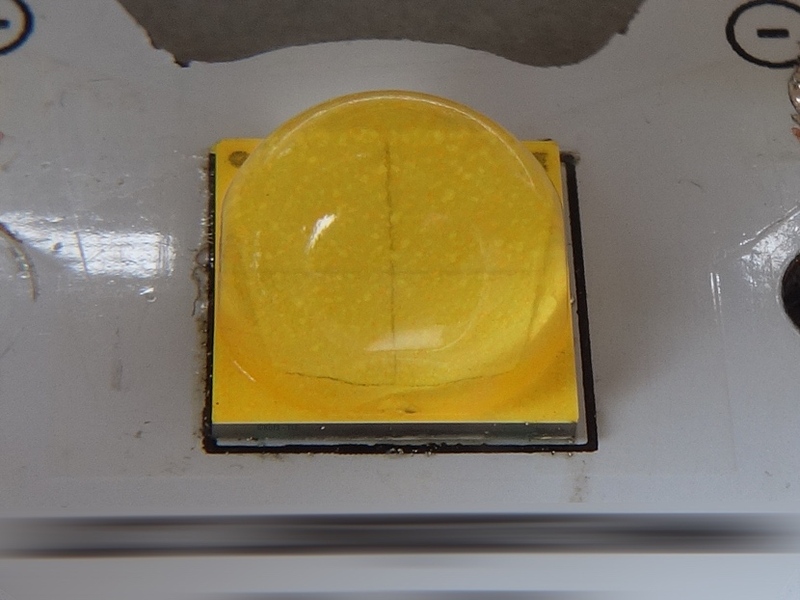 The footprint is the same as that of the predecessor so the whole range of accessories for old XHP footprint should also be compatible for this new LED. This allows lower development costs when updating products. On the pictures the four dies can be easily discerned. Because of the symmetric shape of this LED it's possible to use lathe spun components for spacers or insulation gaskets. Like the XHP70 the needed voltage can be set via the LED PCBs electrical layout. All available XHP70 and 70.2 are suitable for 6 or 12 V forward voltage. If the middle contact on the LED (thermal pad) is isolated from anode/cathode electrically, the LED runs on 6 V config (2S2P). Otherwise, if the thermal pad is connected with anode/cathode, the LED runs on 12 V config (4S4P), which halves the needed current but also doubles the needed voltage. Also see this image (Cree) for visual explanation. 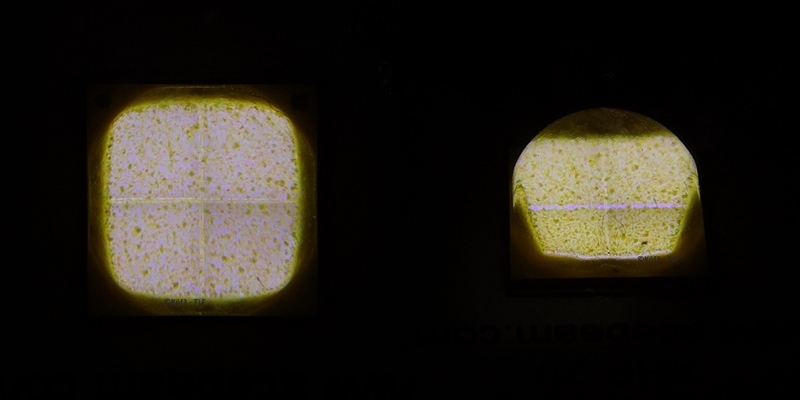 The visible light emitting surface area is bigger than that of the XHP70 – but the gaps between the four dies are noticeably smaller, too. Because of that, the surface brightness density should be lower despite the higher possible lumen output. 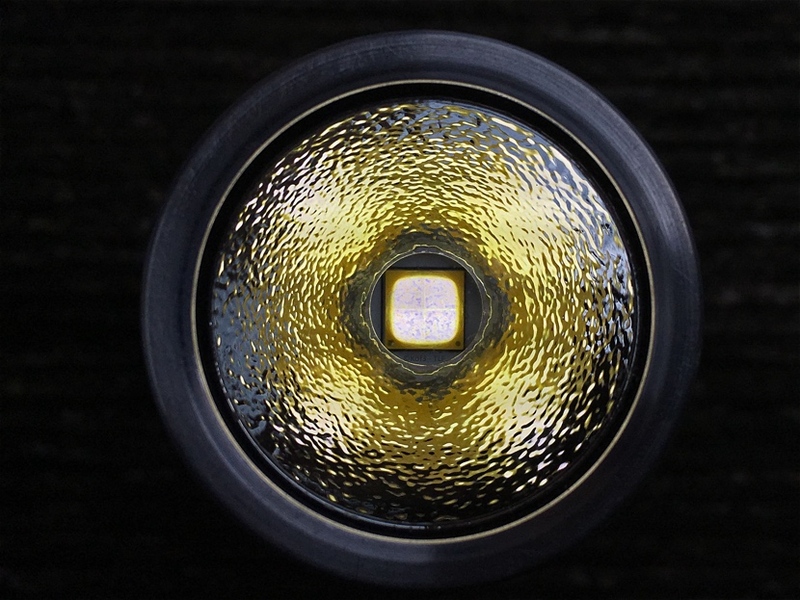 Typical for the new Cree LEDs is the blue-yellow-dotted phosphor layer on the surface, and the yellow layer around the dies. The gaps between the single dies are small and also covered with phosphor. Because of this they emit too light. The total light emitting surface (LES) area of the XHP70.2 is 31.52 mm² (0.0489 sq in) in size. The four single dies are 7.88 mm² (0.0122 sq in) each. I compared this LED with other popular emitters, like XHP50.2/70 and MT-G2. 25 °C Tsp, unless noted otherwise. You can find the raw data here! The emitter tested does not reach the binning specified from Cree (1,830 lm @ 85 °C/2,100 mA). It’s not P2, but N4 (1,710 lm). I measured a lot of emitters (around 30) in my test setup. Most of all light flux results (also calculated to 85 °C Tsp) are equal to specified binnings, sometimes lower, sometimes higher. A XHP50.2 tested and shown in the diagram corresponds to the binning specified by Cree (J4). Currently I cannot measure the luminous flux at 85 °C directly. So I had to calculate the flux for hot binning (85 °C) acc. to the specs in the datasheet. From 25 °C the decrease to 85 °C in luminous flux is around 12,5 percent. 20 Amps lab power supply maxed out! The XHP70.2 is so powerful that my new power supply (20 A @ 30 V max.) limits the maximum possible current in this test. The maximum should be reached at 21 to 24 amps, at approx. 9,300 to 9,500 lumens. LED will be consuming 170 watts! At such an ultra high power a big heatsink and also a good heat dissipation is absolutely required! 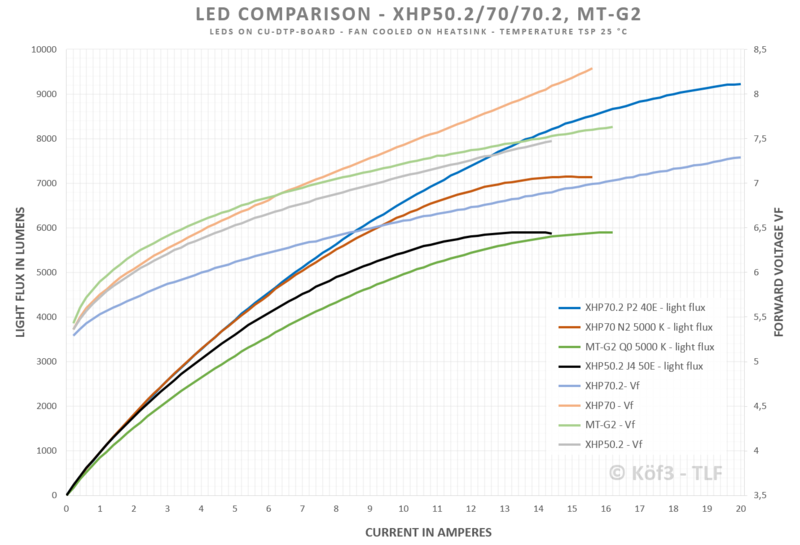 The XHP70.2 performs much better than all other tested LEDs here. The overcurrent capabilities are better and the light flux maximum is at over 20 amps – the maximum range of my power supply. Moreover, the Vf is a lot lower than that of the other emitters, which improves the efficiency (lm/W) a lot. The XHP50.2 used in this diagram is measured with bin J4. This is a sign that the XHP70.2 actually emits less total flux than stated in the datasheet for this bin. The measurements here were done in a totally dark environment, with no reflections on the lux meter. Caution: These values for every LED shown here are invalid until I announce new measurements because of substancial changes of the luminance test method. Light color neutral white (4000 / 5000 K), unless noted otherwise. 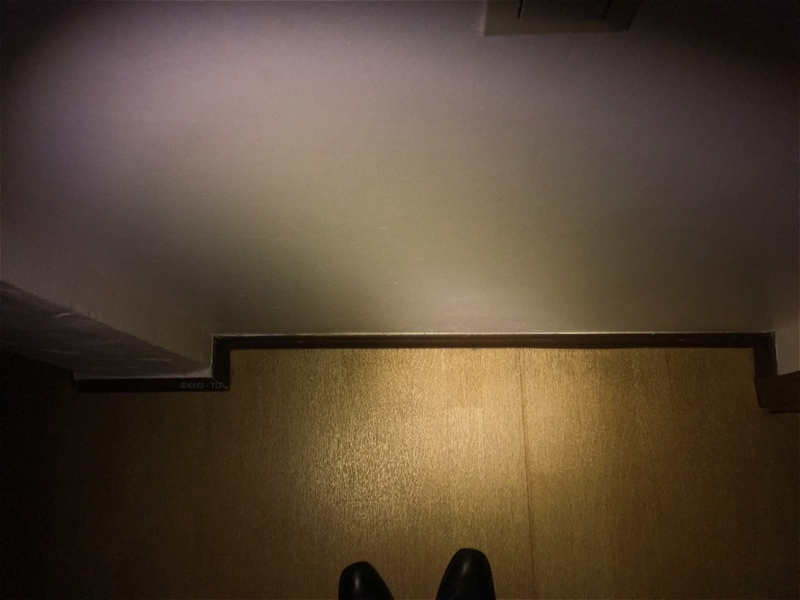 The surface brightness of the XHP70.2 is higher than that of the XHP70, but it profits only from the higher maximum current and the higher luminous flux, resulting from this. 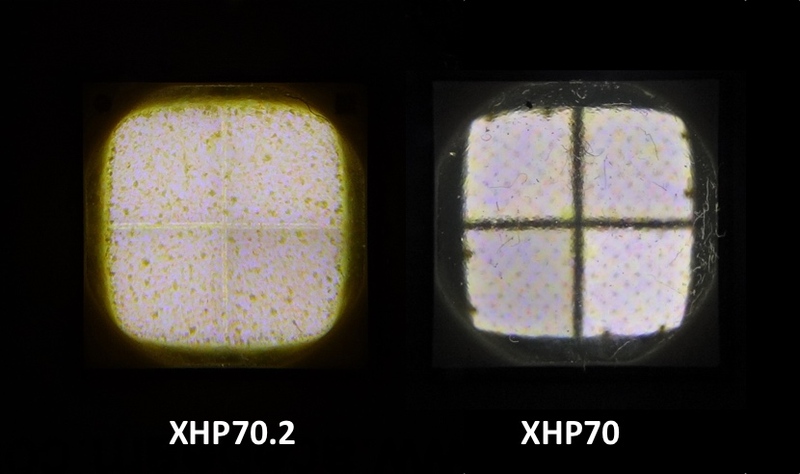 At lower currents the XHP70 performs a bit better, simply because of the smaller light emitting surface. The XHP50.2 and XHP35 perform a lot better and deliver a substantially higher luminance due to high power denstiy (XHP50.2) and dome-less construction (XHP35 HI). Just for comparison: the SYNIOS DMLN31.SG tested here delivers 297.8 cd/mm², the Osram Oslon Black Flat 266.5 and the good old XP-G2 S4 2B 197.3 cd/mm². 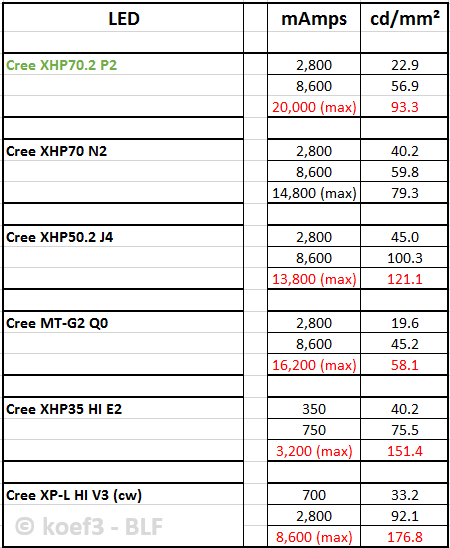 The newest generation Cree LEDs (XP-G3/L2, XHPxx.2) are similar to each other. 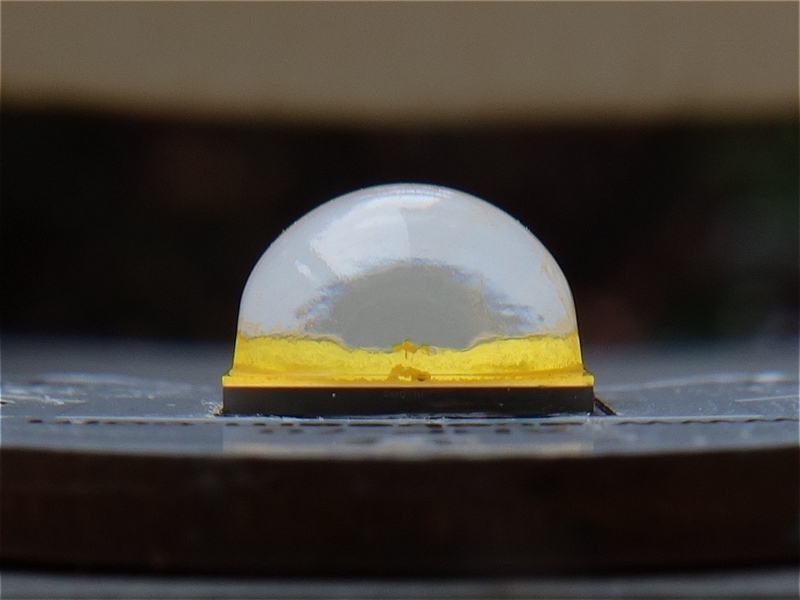 The all create a yellow-tinted corona around the spot when it's used in conjunction with reflectors and clear lenses. With this LED it’s the same. To show you this problem in a more practical manner I put the tested emitter in a flashlight which is normally used with a XHP70. 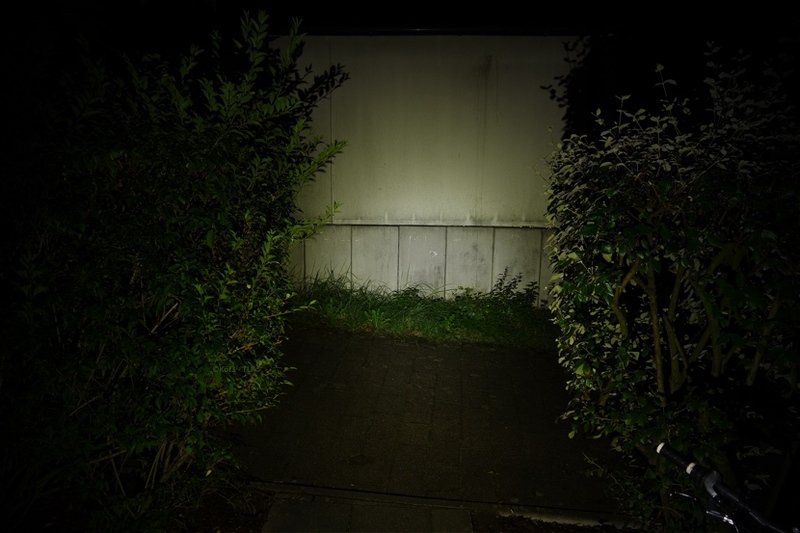 It delivers round about 2800 lumens with one 26650 and is equipped with a OP reflector, what should improve the light pattern. The yellow-colored corona is visible and annoying. The spot is definitely cooler than the stated 4000 K CCT - I estimate the color temperature is higher than 4500 K.
The specified color temperature can only be reached in cb (ceiling bounce) situations or in optics which mix the light, like diffusors or TIR optics. In a flashlight this doesn’t happen in most cases. But not everything concerning light quality is bad. Because of the missing “gaps” between the single dies, the known “cross” in the spot is in case of using reflectors or lenses totally eliminated and not visible anymore. 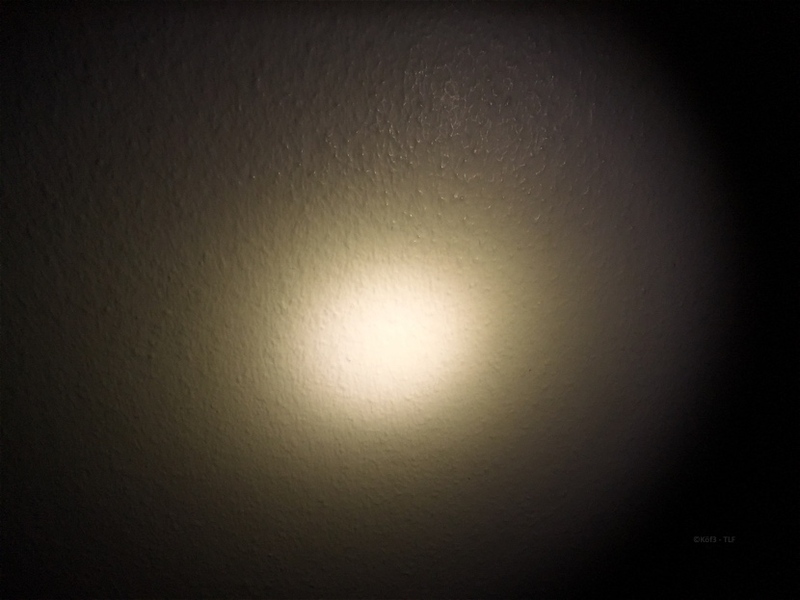 This problem, known from many standard flashlights, has largely been solved through usage of special/modified reflectors or diffused/matte lenses. The XHP70.2 is a noticeable leap in performance and overcurrent capabilities. With 9228 lumens and 146 watts makes this one of the brightest power LED available today. The light emitting surface is bigger than of the XHP70, in addition to this the beam pattern not only on the whitewall isn’t so good at all. 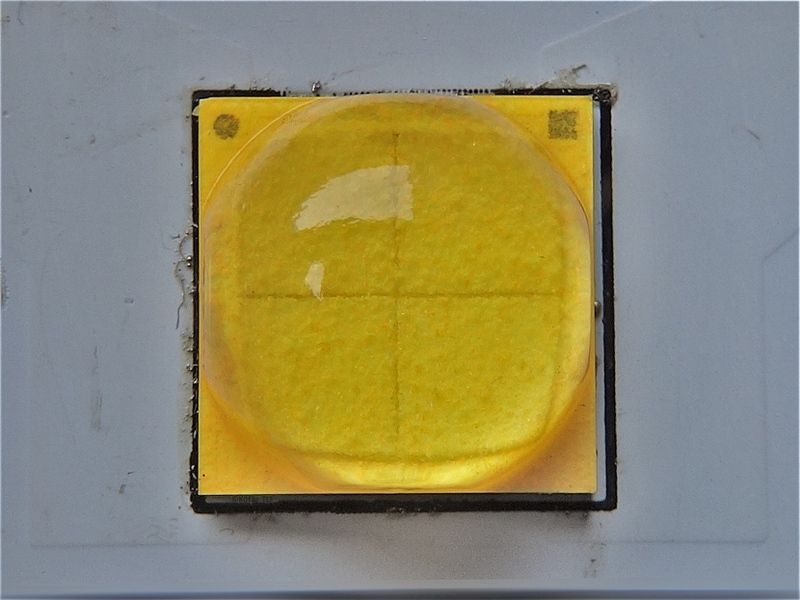 The yellow rings/areas around the spot known from other Cree LEDs like XP-L2 or XP-G3 exists here too. On the other hand, the „cross” known from it’s predecessor XHP70 is not visible anymore. When high luminous flux is the highes priority and the light quality (if used with optics) can be neglected, this LED is currently the best choice! Mistakes and suggestions are best sent via pm. Anybody tried 4s yet? Can you drive it close to the peak? koef3, could you add CFT-90 to the charts? I also didn’t know the dies are considerably larger than in a XHP70. Important hint: Luminance values in chart are fixed now. The previously ones are wrong. @Jerommel: Thanks for suggestion with lm/W chart. Is noted, follows probably in a later thread with all important values and measurements of well-known LEDs. There is a BLF development fund. Maybe we could make a research fund as well? Would be awesome to get raw data here too. It would be great to see dedomed XHP70.2 test as well…. Like other emitters light flux should be 15 to 25 percent lower than of domed variant. Vf doesn't change, also the overcurrent capabilities. To be honest, I think the great effort for a new test of dd XHP70.2 is not justified. But raw data are coming very soon. If you create diagrams / comparisons with this data or using these for other purposes, I would ask you to publish these charts in this topic and also to specify the source of the data used. I’ll publish what I have when I’m ready with it. Though I wonder where should I do it – because I just compare LEDs with each other. Hey do you know of any XHP70.2 tests with a shaved dome? Would you be able to do one? In this thread you can see the shaved dome XHP70.2 outperform the XHP35 HI for intensity by about 20%, which I would estimate the XHP to be fairly close to 150-200cd/mm^2 near max power. 200cd/mm^2 is not as good as the 230 of the CFT90 but at double the lumen output it would still be very impressive. Especially since it would have more than double the efficiency of the CFT90. Would you be able to do one? Actually I have barely time to publish new tests, because I will start my new job in two weeks. I can't promise for any, but I'll see what I can do. I doubt VOB’s intensity reading. He mentions to take them with a grain of salt. He has the lux meter at the end of a hall, so light bouncing off the walls of the hall reach the lux meter and inflate the reading. That effect would be larger for a larger diameter beam (more light bouncing off the hall walls), so the measurement with the XHP70.2 would be more inflated than with other smaller emitters. I wouldn’t expect the sliced XHP70.2 luminance in a reflector light to be above 100cd/mm^2. I can’t promise for any, but I’ll see what I can do.